They say that nobody rides public transportation In Los Angeles. If that’s true, then every week I ride with a few more than 20,000 “nobodies” traveling through the deep recesses of the Valley on a strange hybrid known as the Metro Orange Line. 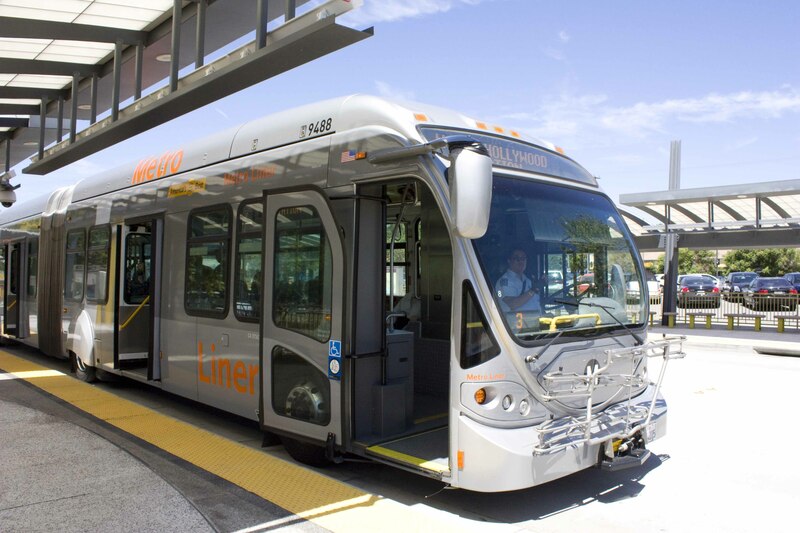 Part subway, part bus, the Orange Line is a mutant in the world of public transportation that runs a 14-mile route from Warner Center to North Hollywood. It’s a bus, all right. It lugs 60 or so passengers at a time to and from the Valley in its longer-than-usual belly. But it’s also a subway, gussied up in silver and gray like all Metro trains, and named after the Valley’s former carpet of citrus trees. Like all subway cars gunning their engines with impunity, it coasts on its own dedicated road, unrestrained by the traffic that chokes the regular lanes. So if the Orange Line is a chimera of transportation, that makes me one of the brave adventurers willing to ride the beast. But it doesn’t take much courage to ride–in fact, the experience is much more pleasant than either a subway or a bus, not to mention my car. Unlike subway cars that ride in the deep, dark wombs of the city, the Orange Line sails along in the sunshine. If I’m lucky enough to get a window seat, I can see the cars stop and start alongside the bus, hampered by traffic lights as we cruise. As the bus coasts from one stop to the next, I see the trees from nearby Lake Balboa Park and joggers and bikers making their way in the morning sun. Often, I ride the bus alone on the way downtown to interview someone for a story or to come in for my part-time job. (I’d rather not find parking, thank you). A petite, non-threatening woman with an evidently friendly disposition, I often become a prime target for casual conversation. Sometimes, it’s eye-opening, like when a fellow passenger told me about the post-production house that exists just to turn 2D movies into 3D; other times, not so much. On the Orange Line, where almost everyone is heading toward the Red Line terminus in North Hollywood to switch to a downtown-bound train, people often are in for a lengthy ride. On my half-hour ride I’ve come across a woman reading my magazine over my shoulder (she works for L.A. Mart downtown), a man happy to give me tips on how to buy a foldable bike (he proudly showed off his own) and a woman who must have been a preacher in a past life. As we rode, she scribbled notes her weathered notebook. Then she flipped her phone open and began what a conversation that would last the whole ride. “I just realized I need my life to change …” she related to the stranger on the other line. As she said those words, I averted my gaze from her and rested my eyes on the busload of people squeezing this way and that, all trying to get somewhere. I thought, “She isn’t so crazy after all.” Ensconced as we all were within the confines of the silver-grey bus, we were all part of the bigger picture–a picture all too easy to lose sight of in the age of getting what we want, how we want it, when we want it. It’s even easier to forget my own relationship to the whole when I’m zipping in and out of freeway lanes alone in my car. A ride on the bus for me is many things. On the Orange Line, it can be a ride through history itself, as the lumbering bus travels over the same roads the Southern Pacific Railroad and the Pacific Electric Red Car once did. It can be a reminder of how inextricably tied we all are to each other, as the woman taught me, or it can simply be a time for quiet reflection on the way home after a long day. As I made my way home from work on a westbound Orange Line one evening, it seemed as though the bus was chasing the setting sun. I had the perfect seat to see the sky turn from velvety blue to dark purple tinged with orange and pink, then a deep black blue hue interrupted by winking stars. It’s unexpected inspirations–like wannabe-Oprah’s surprising wisdom or that rich tapestry of colors during the sunset–that make me glad I hadn’t taken my car. I might have been home in a fraction of the time, but I would have missed the world around me. Carren Jao is a freelance art, architecture and design writer based in Los Angeles.